For those hungering for high definition, Sky may seem to be the obvious option. But that's the great thing about options, there's always more than one of them. Humax's HDCI-2000 is another of these - a receiver that is made for both kinds of broadcast: the standard and high-definition variety. While there's still a dearth of HD material out there at present, channels like BBC HD are not encrypted and can therefore be watched by anyone with the right equipment. You can also dip into any of up to 250 free SD channels from the BBC, ITV and Sky that make up the Sky Digital package. With a more complex setup even more channels can be sought out from those that are intended for foreign markets. The costing options are myriad and slightly confusing so it helps to know what you want first. The box costs the same as Sky's but not all boxes are the same (look at shoe boxes). For starters, there's no PVR, nor is Sky Videoguard CAM available. You pay more for a dish or its installation - though it can be run from a current Sky one. But at least you won't have to pay a subscription for it. Two common interface slots are provided for plug-in CAMS for hooking up foreign satellite TV networks rather than Sky. 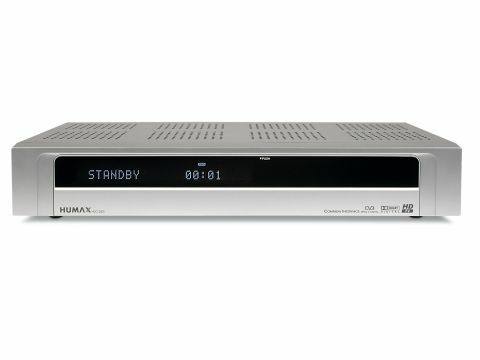 But unlike the Sky box, this Humax box is DiSEqC compatible - a state that's near impossible to pronounce but easy to connect multiple or motorised dish systems to. The Humax lets you store up to 4,000 channels - so channel-hopping alone will be a 24 hour job. The downside though is the setting up of the box, not just in comparison with the Sky version, but when watching the Sky channels themselves. The 7-day EPG works well enough but it can only show 'now and next' options for Sky Digital channels as the EPG data is the non-standard variety. High-definition pictures were everything we hoped them to be without any visible blemishes. Planet Earth was the stand out show for bringing the best from the format's wide colour palette and attention to minute detail. Either 720p or 1080i can be selected as an output format. Pictures via HDMI and component video were also top notch. Standard-definition pictures via the Scart, while a big step down from the HD equivalents, were still very much beyond reproach. Strangely, the standard-def pictures didn't look as good when viewed with the HD connections, so it's worth experimenting a little to get what you want. Pictures should be heard as well as seen so we were happy to note that the optical audio output channelled out Dolby Digital flawlessly. Overall, the HDCI-2000 performed well across a wide spectrum of channels displaying a consistency of quality sadly lacking in its source material.